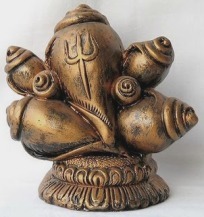 Shop for "Instant Nirvana" ! Product Manjushri Statue MANJ001 is one of our prized collection of Manjushri Idols from our Buddha Bazaar, where you can buy Manjushri Statues of all Tibetan Art & Craft. 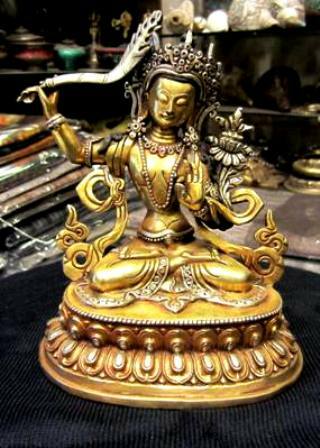 In this online store the statue of Manjushri has been empowered with the wisdom mantra scroll, blessed by a high lama and embedded inside. This mantra scroll has been blessed by a high lama for your home prosperity, well being and wisdom of your family. Sitting on a hand embellished lotus seat, the figurine Manjushri Idol, is a gold gilded bronze statue, hand crafted to the perfection of an artist's vision of a God of Knowledge n Wisdom. In your home a Manjushri Statue along with other Buddha Statues radiates the Energy of an Enlightened Mind, which can focus on its goals and achieve 'nirvana', in its fulfillment of the soul. The right hand of Manjushri holds the Sword which cuts the head of Ignorance and the left hand holds the Pure Lotus Flower refecting the power of an enlightened Mind. In the Buddhist world the Mind holds the vision of a prosperous Universe which allows auspicious growth and showers spiritual blessings to all. A dark world denotes the evil of an ignorant mind which has to be destroyed by the Power of Perception, Good Karma and Meditation. "oṃ a ra pa ca na dhīḥ". All kinds of Buddha statues, Tibetan Idols can be purchased on on our online store for a complete collection of Buddhist prayer items. MANJUSHRI STATUE MANJU001, BUDDHIST GOD OF KNOWLEDGE WITH WISDOM MANTRA SCROLL. Length: 06 inches, Breadth: 04 inches. Gift included: A small tibetan prayer wheel with Om mane padme hum mantra in hand spun textile pouch.